The best way to draw a PPF is to find how many of each good the firm can produce if they produce that good only. In this case we are told Rolls Royce can either produce 50 car parts, 100 aircraft parts, or a mix. This means we know the point (0, 50) and (100, 0) are on our PPF. Simply label these points and connect them to find Rolls Royce’s PPF. 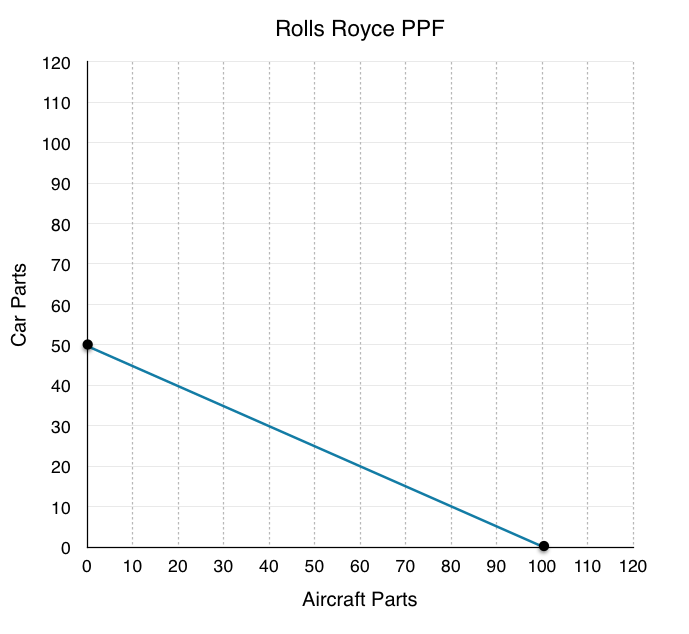 Remember that the marginal opportunity cost of the good on the x-axis, in this case aircraft parts, is simply the slope of the PPF. Taking the slope we find that we must trade 50 car parts for every 100 aircraft parts, this means that the marginal opportunity cost of one aircraft part is 0.5 car parts. The marginal opportunity cost of the good on the y-axis, in this case car parts, is equal to the inverse of the slope. This means we must trade 100 aircraft parts for every 50 car parts. 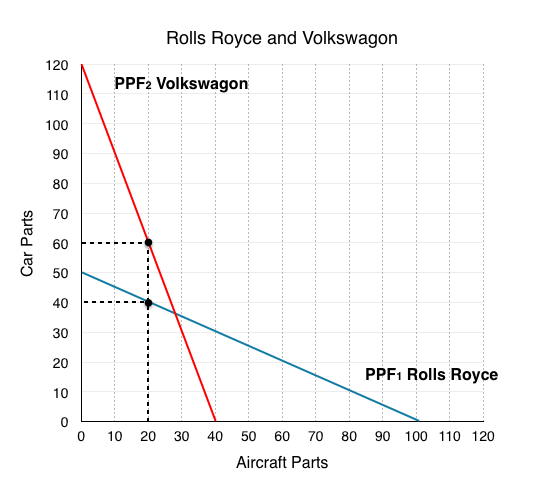 The marginal opportunity cost of one car part is 2 aircraft parts. Since there is no opportunities for trade, this is a relatively simple problem. All you have to do is draw a line up from 40 aircraft parts, and see how many car parts Rolls Royce can make with the remaining resources. Looking at the diagram you can see that when Rolls Royce produces 40 aircraft parts, they can produce 30 car parts. Rolls Royce can produce a maximum of 100 aircraft parts, and for every 10 they give up they can make 5 car parts. If they are only producing 40 aircraft parts they have given up 60. The trade off in the production of 60 aircraft parts allows them to produce 30 car parts. Again, the best way to draw a PPF is to find how many of each good the firm can produce if they produce that good only. Based on the information we are given, we know the points (0, 120) and (40, 0) are on Volkswagon’s PPF. Simply label these points and connect them to find Volkswagon’s PPF. 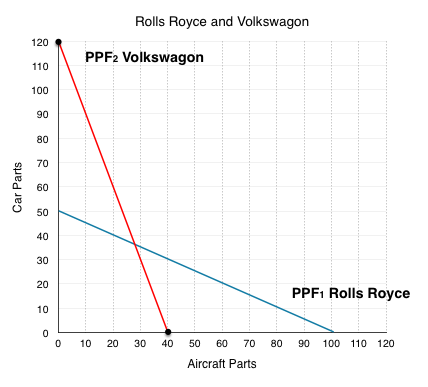 Taking the slope of Volkswagon’s PPF, we find that we must trade 120 car parts for every 40 aircraft parts, this means that the marginal opportunity cost of one aircraft part is 3 car parts for 1 aircraft part. The marginal opportunity cost of the good on the y-axis, in this case car parts, is equal to the inverse of the slope. This means we must trade 40 aircraft parts for every 120 car parts. 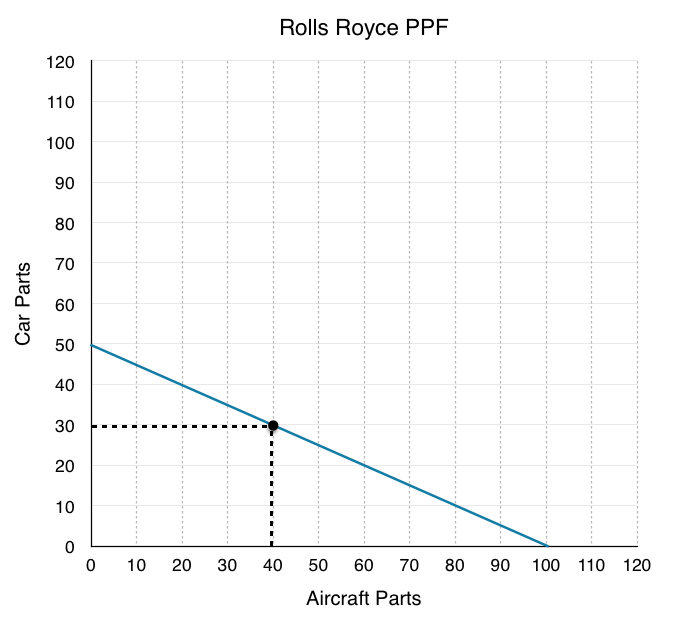 The marginal opportunity cost of one aircraft part is 0.33 aircraft parts for 1 car part. The firm that can produce the greater number of each good has the absolute advantage in that goods production. Since Rolls Royce can produce 100 aircraft and Volkswagon only 40, Rolls Royce has the absolute advantage in aircraft parts. Since Volkswagon can produce 120 car parts and Rolls Royce only 50, Volkswagon has the absolute advantage in car parts. Recall that the firm with the lower opportunity cost has the comparative in the production of the good. In this case Rolls Royce only has to give up 0.5 car parts for 1 aircraft part, whereas Volkswagon has to give up 3! This means Rolls Royce has the comparative advantage in aircraft parts. Volkswagon only has to give up 0.33 aircraft parts for 1 car part, whereas Roll Royce has to give up 2. This means Volkswagon has the comparative advantage in car parts. This means that when possible, Rolls Royce should specialize in the production of aircraft parts, since they have lower opportunity cost of producing them. *Note that in this example each firm has both the competitive and absolute advantage in their good, but this need not be the case. One firm could have the absolute advantage at both goods, but there would still be mutually beneficial trades available. 8. Assume each firm needs 20 aircraft parts and cannot trade. How many car parts is each able to produce? What is the total amount of car parts? If the firms cannot trade with eachother then this exercise is identical to Question 3, just with two firms. All we have to do is draw a line up from 20 aircraft parts, and see how many car parts each can produce. As shown in the diagram above, Rolls Royce can produce 40 car parts, and Volkswagon can produce 60 car parts for a total of 100. 9. If the market is opened up to trade, represent the efficient production of 40 aircraft parts on the PPF. What is the total number of car parts produced? If the market is open to trade and we need 40 aircraft parts, they won’t be produced as they were in Question 8. When we are told how much of a specific good we want, the firm with the comparative advantage in that good will produce as much of that good as they can (up to the total). In this case Rolls Royce has the comparative advantage in aircraft parts so they will produce all 40. Notice that when Rolls Royce produces 40 aircraft parts, they are still producing 30 car parts – that is fine. We can not say that Rolls Royce should produce more than 40 because if we only want 40 aircraft parts, there is no reason to produce more (no one will buy them, there is no use for them, etc.). The remaining resources should be used to produce car parts. If Rolls Royce is producing 40 aircraft parts, they are also producing 30 car parts. Since we do not need anymore aircraft parts, Volkswagon can focus on what they are comparatively better at and produce 120 car parts. This is the most efficient way for the firms to produce 40 aircraft parts and results in a total of 150 car parts (120 car parts from Volkswagon + 30 car parts from Roll Royce). Note that this follows the rule in Topic 2.3 where we stated that if at least one player is maximizing their comparative advantage, then the situation is efficient (in this case Volkswagon is maximizing). Trade results in a Pareto improvement as the total number of car parts increases. This means that Brexit results in both companies having less car parts, which means less revenue. Policy restricting trade has made it so neither company can focus on what they are comparatively good at. If Rolls Royce wants to produce cars, they have to produce the car parts themselves at higher costs. This is why we say there are ‘gains from trade’ as whether you were the British company or the German company, both parties stand to benefit. Solutions: Case Study - Brexit by University of Victoria is licensed under a Creative Commons Attribution 4.0 International License, except where otherwise noted.